Here are a dozen dressy patterns for women and teens. First, “afternoon” dresses, for formal events, dinners, and tea dances. Butterick afternoon dress 1796, Delineator, January 1928, page 34. She holds her clutch bag under her arm while adjusting her gloves. Left, an alternate view of dress 1796, with coat 1836, center, and a dressy combination: Blouse 1782 with skirt 1808. This afternoon dress is really a practical skirt and blouse combination, Butterick blouse 1782 and skirt 1808. Delineator, p. 34. January, 1928. 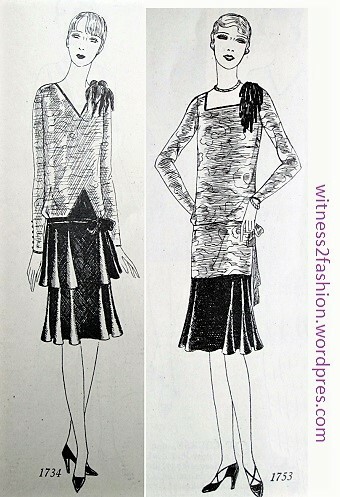 The top and skirt could be paired with others, in different colors, like the afternoon skirt and blouse combination shown below. A simple twenties’ blouse is combined with a top-stitched skirt and a fox stole. Butterick 1778 with skirt 1839, from January 1928. There is a chenille pom-pom/flower on her shoulder. Butterick afternoon dress 1823, Delineator, January 1928, p. 34. Butterick afternoon dress pattern 1802, Delineator, January 1928, p. 34. Although the fabric is a print, the long side drape on this surplice dress makes it too formal for casual or office wear. 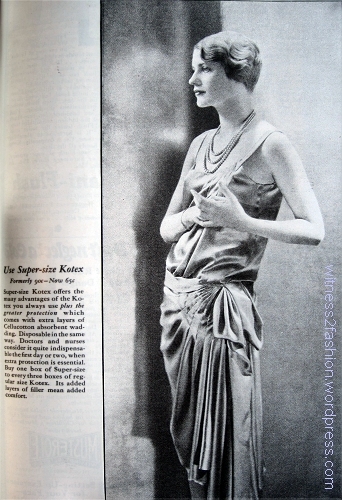 Alternate views of afternoon dresses from Butterick, January 1928. These views show less formal hemlines without dipping draperies, and long or short sleeve options. Butterick evening dress 1801 has long fringe on the skirt and on the shawl. Delineator, January 1928, page 35. The complex bodice would be interesting enough without the shawl, which seems to have had two pattern options, as a scarf or a shawl. Butterick evening gown 1806 has fluttering draperies and a deep V in front, revealing a contrasting “vestee” (under bodice.) January, 1928. This pattern could be purchased up to size 46! Butterick 1807 has surplice lines and a side drape that flows from pleats [or gathering] below the knot. 1928. Delineator recommended this style for “women with small hips….” It wasn’t available in large sizes. Butterick evening dress 1838, another surplice style from 1928. It’s hard to distinguish a picot edge from a line of beads in drawings this small. The neckline is bordered with rhinestones, but the flying panels may have a picot edge or they may be illustrated as having self-colored beads spaced about a quarter of an inch apart along the hemmed edges. Alternate views of Butterick 1806, showing the back tie drapery; dress 1838 with a flowing panel that is either beaded or picot hemmed; and coat 1804, which has an interesting yoke and pleated (?) back, much more interesting than its front view. Butterick evening dress 1841, from 1928. 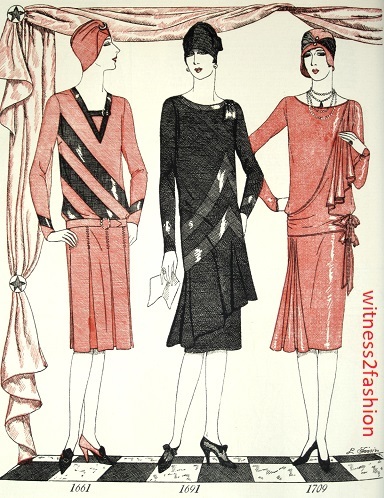 Scalloped hems that dipped low in back were frequently featured on Butterick patterns in the Twenties. They were often recommended for younger women. This pattern was only available for “14 to 20 years” and maximum bust size 38″. Butterick patterns for young women, Sept. 1926. Number 7047, left, and 7063, right. In this case, the skirt was lined with a different color, which matched the stockings. However, some dresses for teens (and small women) were more sophisticated. Two evening dresses for “15 to 20 years,” Delineator, January 1928; Butterick 1791 and 1795. The one on the left is beaded. The other is made of “transparent velvet.” Dresses for teens and small women were usually shorter than other dress patterns. Crepe satin is matte on one side and shiny on the other. Using the two textures in the same color was very popular in Deco-influenced Twenties’ dresses. A dress for teens and small women; Butterick pattern 1798. From Delineator, January 1928, page 36. 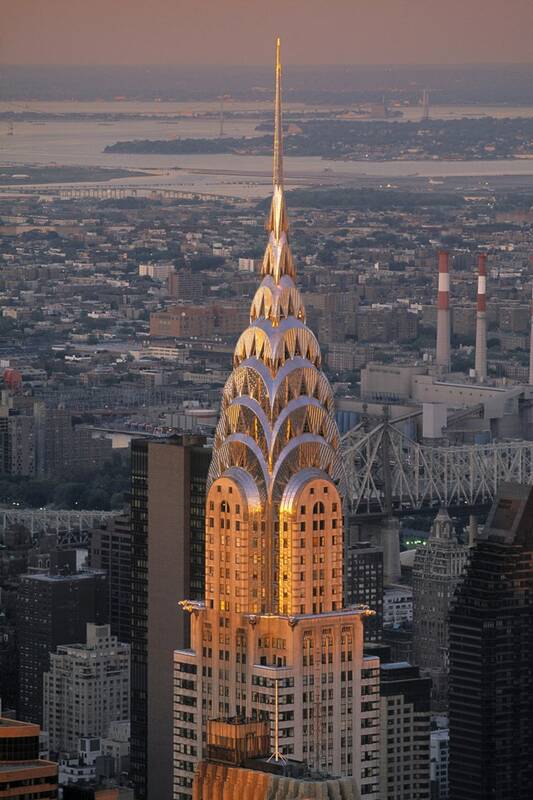 Those parallel curves and points remind me of the Chrysler Building turned upside down.